Had an amazing weekend. 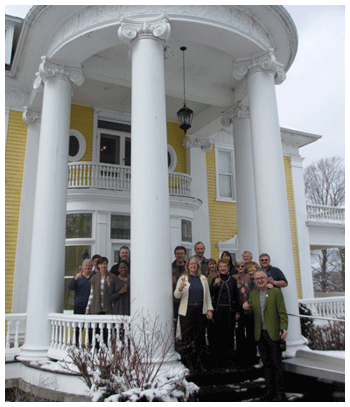 Fourteen wonderful people joined Kato and I for our first County Wine Camp at the Claramount Inn in Picton. 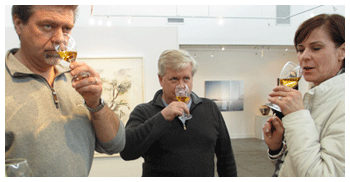 Closson Chase barrel sampling was outstanding, and the Wine and Art tasting at the world-class Oeno Gallery was thought provoking. Chef Elliot Reynold’s food was beautiful and delicious. First night was a bistro dinner with guest of honour Dan Sullivan from Rosehall Run. 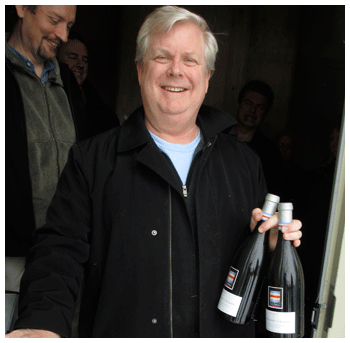 His wines were elegant, flavourful and restrained. Steak tartare started the night with Rosehall Run classy Pinot Gris, seared scallops were paired with Rosehall Run 09 Estate Chardonnay, followed by Dan’s 08 Cabernet Franc with duck confit. 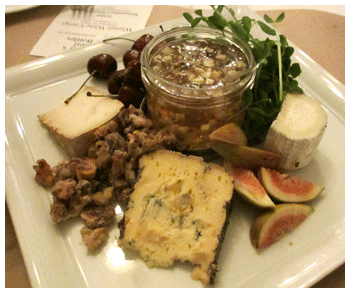 A beautiful cheese plate paired with Karlo Estate ‘Vanalstine’. 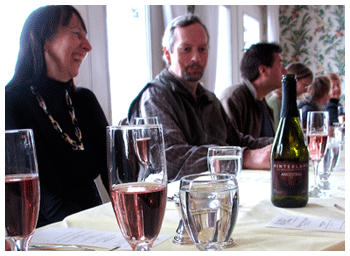 A big Pinot Noir tasting followed dinner at the clubhouse…. Saturday‘s bus ride took us to Closson Chase, Oeno Gallery and Barley Days Brewery. Saturday night dinner was more formal – starting with ‘local’ martinis. Amuse bouche was foie gras mousseline, counter-balanced by the Kent-he Pinot Sauvage – a most unusual experience. Seared tuna paired with Closson Chase Chardonnay followed, and Keint-he Pinot Noir was poured for the roasted lamb main. 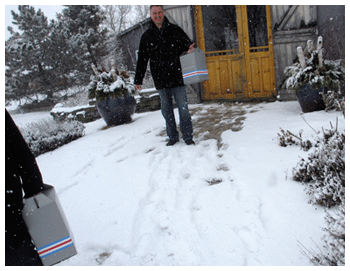 A County Cabernet Franc tasting followed…. Breakfast was splashed with a bit of Hinterland’s Ancestral – low in alcohol and pretty in pink – just the perfect thing for Sunday breakfast. Won’t list ALL the wines tasted, but instead, let these pictures do the talking. I’ll be writing more about County wines later. Stay tuned. What’s said at the clubhouse, stays at the clubhouse! . . .Terrific ambiance, great food & wine, outstanding accommodation – wonderful time . . .
. . . One fantastic experience with unique wines from the County, and some fantastic dinners. The gallery visit was an eye opener . . .
. . . An amazing weekend where I learned about wines in a fun environment. And great value . . .
. . . Never thought I could taste 30 wines in one day. Your late night stints were a delight. . . .